For a quieter experience, visit on weekdays, months from November – March, and on days where the temperature is below 60 degrees. Be sure to bring a comfortable pair of walking shoes. Bring a refillable water bottle to use at any of our water refill stations throughout the Zoo. Help us recycle! Our new recycling program makes it easy to recycle. Just put your dry waste in any waste bin with a clear bin. Wet waste goes into the bins with black bags. The dry waste is taken to the recycling plant, where the experts at WestRock Recycling sort it all out. Don’t forget to bring your sunscreen! Students must stay with their assigned leader at all times. There must be one adult chaperone for every ten children. Selfie-sticks, balloons, bicycles, skateboards, skates, hoverboards, heely skate shoes, glass containers or other items that could injure animals or people are not allowed on Zoo grounds. Visitors may have radios in public places if they keep them at a low volume. Be respectfully quiet. Shouting disturbs animals and other guests. No pets are allowed at the Zoo except for service animals. Emotional-support, comfort and companion animals are not permitted for the safety of our collection. Please notify the Zoo’s reception area or ticket taker about your service dog. Alcoholic beverages are not allowed to be brought on Zoo grounds by guests. Intoxication. If you see a visitor that appears to be drunk or on drugs causing a disturbance of any sort or threatening to harm an animal or guest, please contact a Zoo staff member for assistance. The Zoo reserves the right to refuse admittance to such persons and to request them to leave. Please do not call 911 as the Zoo staff is trained to manage issues and emergencies. For the comfort of all guests, smoking (tobacco, e-cigarettes or other products that produce vapor) is prohibited throughout the Zoo except in three designated outdoor smoking areas. 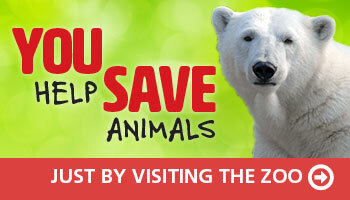 Find locations marked on your Zoo guide map. We appreciate your cooperation. Unauthorized drones over Zoo property are not allowed. For your safety in the Zoo, please walk. Don’t run. We ask that visitors stay on paved, public walkways, except for in picnic areas. If you see a guest walking off walkways, standing or climbing on exhibit barriers, shouting at or teasing animals, throwing objects into exhibits or littering the Zoo grounds, please contact a Zoo staff member. For your safety and to help preserve the valuable plant and tree collection, please do not pick any plants or leaves. Guests must be appropriately attired. Swimsuits are not permitted beyond the splash park. Shirts and Shoes are required except in the Splash Park. Feeding animals is prohibited throughout the Zoo except in Zoo approved areas! This is to ensure the health and safety of the animals. If you see a guest feeding an animal, please contact a Zoo staff member. For your safety, do not approach or feed the animals that wander freely around the Zoo. If you ever see a person in immediate danger, contact Zoo staff immediately. DO NOT TAKE RISKS IN ANIMAL EXHIBITS. Never attempt a rescue when dangerous animals are involved. Keep your eye on the person and call for assistance. Please do not call 911 as the Zoo staff is trained to provide critical information to emergency personnel. Call the Zoo Receptionist 502-459-2181 ext. 0. Distribution and or sale of literature, goods and services are strictly regulated. Any such activity can only take place if approved by, and with prior arrangements in writing, from the Louisville Zoo Public Relations Department. No Littering. All trash and/or unwanted material should be deposited in the appropriate receptacles provided around the Zoo premises. All parts of the Zoo labeled Employee Only or Restricted Access are prohibited to guests. Improperly dressed guests: The Zoo is a family friendly location and we ask all guests wear a shirt, pants/shorts/skirt, and shoes at all times (with exception of the Splash Park where shirts and shoes do not need to be worn). In addition, guests should not wear any clothing with offensive or vulgar words and/or phrases printed on it. Guests involved in altercations with other guests and staff. Guests abusing animals and/or climbing into animal containment areas. Guests committing a crime such as shoplifting, theft, etc. Contact any Zoo staff member. Lost Child Bracelet: Pick up a Lost Child Bracelet that can be placed around a child’s arm during their Zoo visit and includes a space for parents or guardians to write their name and cell phone number. If a child should become separated from his/her guardian, this will enable Zoo staff to quickly notify you to reunite you with your child quickly. Bracelets are free and can be picked up at the Train Station located on the Main Plaza.